True Currency Meter with Email and SMS push notifications! Have you ever wondered why would some pairs would move more than others, and 100 pips on EURGBP is bigger than 100 pips on EURUSD? And during the news, some would move 200 pips but some would only move 150 pips? This is the key to the newly developed "28 pairs" True Currency Strength Meter. One has to know that all pairs are UNIQUE and are DIFFERENT from each other. "GBP" and "JPY" pairs usually move so fast, but other pairs don't. This is the key to my TRUE CURRENCY METER for a new calculation has been made to balance these 8 Major Currencies. Given that each pair has a different behavior, all of them were balanced in accordance with their market movement, which is basically based on PIPS. A typical Currency Strength meter doesn't even taken into consideration that the VALUE of 100 pips from "EURGBP" can be different from the value of your 100 pips on "EURUSD". But this newly Currency Strength Meter put the calculation into a new level in which all "28 pairs" are calculated with the same bases just to get the Real Strength of EACH CURRENCY. 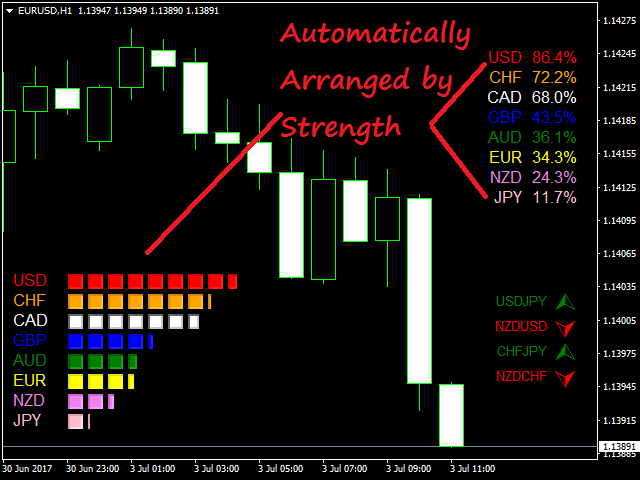 In which, the key to a TRUE currency meter is a "BALANCED CURRENCY STRENGTH METER". PERIOD - input number from 0 to infinite, like 5, 10, 100, 1000 to check the period, *NOTE: putting "0" (zero) means you current candle. Example: D1 with 0 period means the strength on current day candle. Font_1 - Edit your font size for the figures on the upper right side of the indicator. Font_2 - Edit your font size for the figures on the lowest left side of the indicator. Space_1 - The space between the graph and percentage. This are the spaces on the right side of the indicator. Space_2 - The space between the graph and percentage. This are the spaces on the left side of the indicator. Shift - Edit the space between the percent and currency on the upper right corner. Alert_PAIR - This will alert you if there are two currencies going on different direction. Meaning, one is STRONG the other one is WEAK. This would mean that one currency is above 70% and the other one is below 30%. Alert_CURRENCY - This will alert you if there is one currency that is strong or weak. Meaning, either it is higher than 70% or lower than 30%. 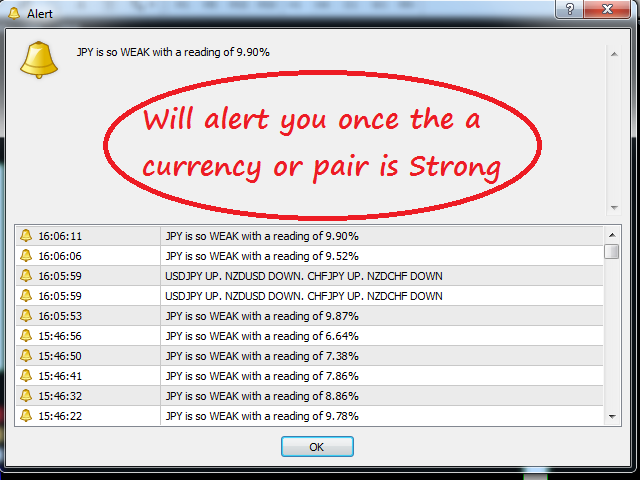 Alert_PAIR_AND_CURRENCY - A mixture of Pair and Currency Alert (new). ALERT_OFF - Choose if you don't want alerts. Sound_Alert__1 - Choose sound alert when a currency is above 70% (ALERT_LEVEL_1_STRONG) or below 30% which is (ALERT_LEVEL_1_WEAK). Sound_Alert_2 - Choose sound alert when a currency is above 90% (ALERT_LEVEL_2_STRONG) or below 10% which is (ALERT_LEVEL_2_WEAK). EMAIL_ALERT - Input When do you want to be Alerted. 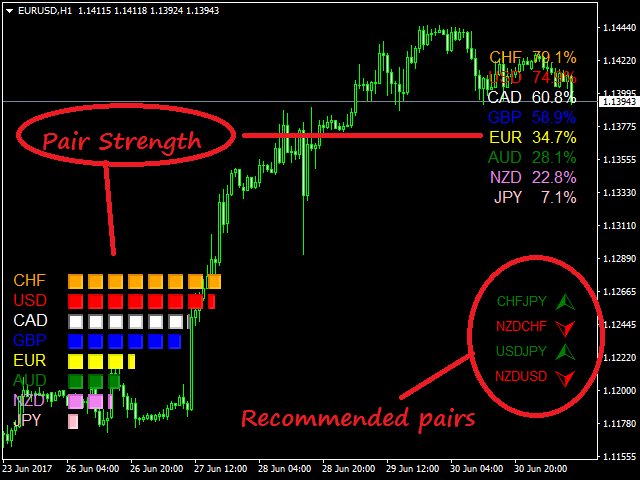 This can be based on ALERT_LEVELS and if you want to be alerted with Pairs or by just Currency Alone. METAQUOTES_ALERT - Turn on or off MetaTrader app alert on phone. EMAIL_SMS_HOURLY_INTERVAL - The HOURLY interval of alerts. Putting "4" means you will be alerted every 4 hour. ALERT_LEVEL_1_STRONG - This is the first level where the Currency is getting STRONG. This must be lower than ALERT_LEVEL_2_STRONG. By default, its value is 70. ALERT_LEVEL_2_STRONG - This is the second level where the Currency is getting EXTREMELY_STRONG. This must be higher than ALERT_LEVEL_1_STRONG. You will hear a different sound alert here which can be edited on Sound_Alert_1. By default, its value is 90. ALERT_LEVEL_1_WEAK - This is the first level where the Currency is getting WEAK. This must be higher than ALERT_LEVEL_2_WEAK. By default, its value is 30. ALERT_LEVEL_2_WEAK - This is the second level where the Currency is getting WEAK. This must be lower than ALERT_LEVEL_1_WEAK. By default, its value is 10. ALERT_INTERVAL - This is in seconds. Where you can edit the Interval of alerts like 1 alert tone every 10 seconds. This is a really good indicator which gives you the long and short term market bias of the market. 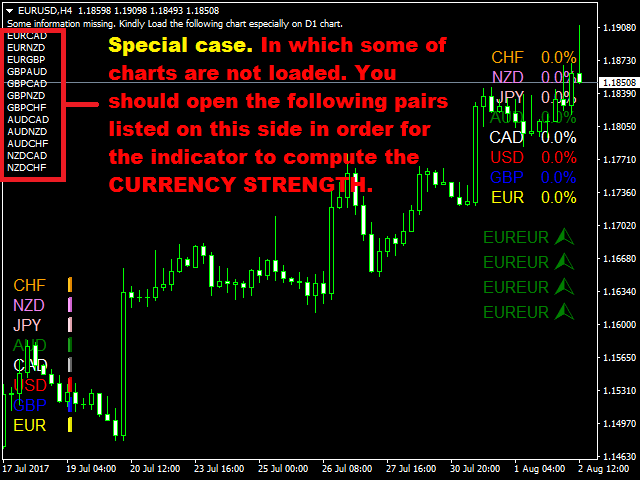 This will enable you to trace which pairs are good to trade. Good Support too! Great indicator and great support. I like how it can email the strengths which enables me to trade just on the phone whenever i am out. I highly recommend this indicator! I will adjust my review with time, but for now (one week) it is really a good tool ! i made +10% of my balance. I use two timeframes for the signals. A very good indicator. And a very helpful seller. Great indicator , and great support. I have requested for some modifications/tweaking and author is responding very fast. thanks and great indicator. if you wont lose your money buy this indicator, bad indicator this talk after I work withe him in real account . Some signal is good, some signal is late, so you should confirm where is support or resistance firstly, then you can filter the bad signal and get the good signal. Very good signal and easy to use. Just put a little logic to it and can be used on a wide range. Can be used either as a fast signal for scalping or can do for long signals for day trading. User-friendly indicator. Very good support too. And usually replies in less than an hour. (I actually wonder why it got a bad review. lol) Overall, it's a good job! Very nice indicator Especially I like how you can change the TimeFrame and Period you want to use. Everything can be customized which makes it user friendly. I also can't wait to have the EMAIL and SMS notification of this indicator. And the author has a good support. I highly recommend this! Using it for almost a month now. And my trades are so stable and became a lot better. Very easy to use and I like how the alert system works where i don't need to look at the chart time to time. Also I feel like this is undervalued for I only bought it for $30 but now is getting higher. I am happy to get a copy when it is a bit cheap. Deserve 5 star for My $500cent account is now $600. Great support also from Emir. Good Job! This METER will definitely make me rich! Very Nice! EMAIL and SMS Notification ENABLED. Space can now be edited between graphs and Percents. Values can now be connected with any other indicator or EA using the following Keywords that can be taken through Global Variable. The Keywords are EUR, GBP, AUD, NZD, USD, CAD, CHF and JPY. Additional Option on Alert. And Option for Interval of Alert sounds in seconds. For people who does not like hearing too much alerts. Can now be back tested. But highly recommended not to base trades on back test because back test have limitations in which you can only use 1 currency pair at a time. Not 28 pairs which is the best setup for forward testing. Instead of just arrows up and down on currency directions, if a currency is less than alert_level_1_strong or greater than alert_level_1_weak, the pair will be noted for not having a clear direction and will be marked with "x". (This is highly based on ALERT_LEVEL_1_STRONG and _WEAK values).